“There are two most important reasons – the first is that last month my wife Birdie and I celebrated our 69th wedding anniversary. 68 of the 69 years I have been a Scoutmaster and during those 68 years she has lovingly supported me in my Scouting volunteer activities plus my other volunteer positions. During those years we had seven children that she raised while I was hiking, weekend camping and spending over 60 summers at camp. I attended Summer Camp at Bert Adams in Vinings from 1950 to 1960, at Bert Adams in Covington from 1951 to 1968, and at Woodruff from 1969 to 2011. How I deserved having such a devoted mate is beyond me. 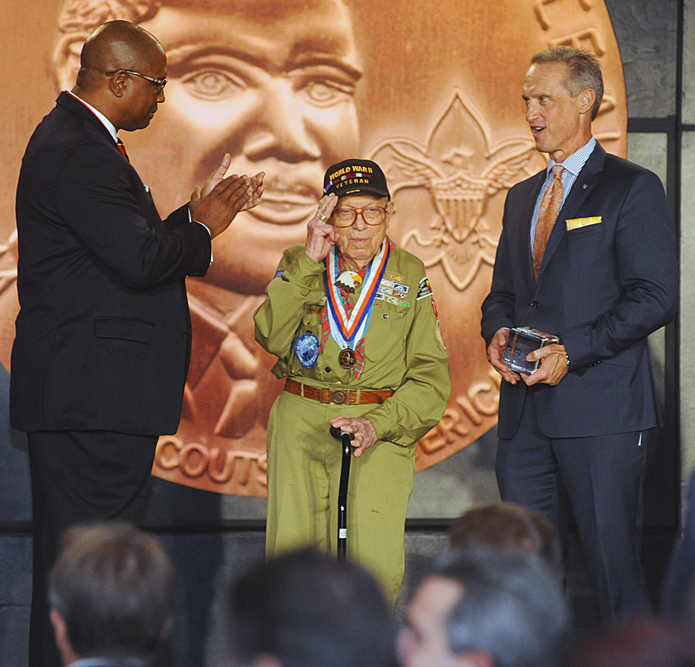 “The other major reason that I have served as a Scoutmaster for 68 years is the incredible number of our Scouts who grew up to be responsible citizens. Time and time again they have come back and told me how important their Scouting experience has been to them. I always say, if only one of them had contacted me to let us know that Scouting was so important in their lives then all my years as Scoutmaster have been worthwhile. “I don’t know if any one of you have had a Scout or Scouter come to you to tell you how important Scouting has been to them. So I want to let you know how important all of you volunteers are in Scouting. And that includes all the Scouters I’ve met dating back to 1934 when I first joined. And what a difference it made in my life and all the hundreds of thousands of Scouts who have benefited from our most important youth program all these years. Josiah Benator has been the Scoutmaster of Troop 73 for 68 years. 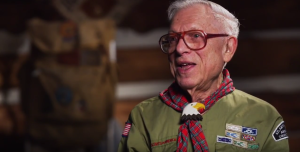 During his time as Scoutmaster he has lead 50 Scouts to the rank of Eagle Scout. Josiah Benator earned the Eagle Scout rank himself in 1943. He has received numerous Scouting awards including the Scouter’s Key Award, the Silver Beaver Award, the Scoutmaster Award of Merit and the Whitney M. Young Jr. Service Award. A veteran of the United States Army during the Second World War, Josiah Benator has received the Bronze Star Medal, the Purple Heart, a Presidential Unit Citation, the American Campaign Medal, the European-African-Middle Eastern Campaign Medal with 3 bronze service stars, a World War II Victory Medal, an Army of Occupation Medal with German Clasp, a Combat Infantryman 1st Award and the Honorable Service Lapel Button for WWII. Josiah and his wife Grace Benator are the parents of Dr. Rachel Benator, Dr. Stella Port, Isaac Benator, Dr. Debra Benator, David Benator, Daniel Benator an the late Dr. Victor Benator.